J Clin Invest. 2006;116(5):1132–1132. https://doi.org/10.1172/JCI28673. John Emsley. The elements of murder A history of poison. 2005. Oxford University Press. New York, New York, USA. 0-19280-599-1 (hardcover)$30.00421 pp. 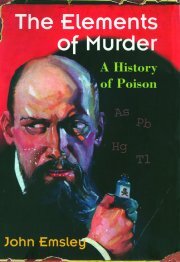 John Emsley has written an entertaining book entitled The elements of murder: a history of poison. He is a chemist who spent many years as a researcher and lecturer at London University before becoming a popular science writer. This enjoyable book is devoted to the poisonous elements found in the periodic table. His description of the chemicals is encompassing and will interest chemists, physicians, and knowledgeable readers of murder mysteries. He even provides an example of how a novel written by Agatha Christie helped in diagnosing a case of poisoning and saving a child’s life. For each chemical, Emsley describes its abundance in the human body, its use in medicine and other products throughout history, and the mechanism and symptoms of its toxicity. The dangerous nature of these chemicals is illuminated by historical case studies of poisoning, and in some instances, current chemical knowledge is employed to reevaluate the evidence and provide new conclusions regarding the guilt or innocence of the accused. The book contains interesting commentary and hypotheses on the lives and deaths of such famous figures as Rasputin, Mozart, and King George III. These are certain to catch the reader’s eye. Even the case studies provided on unknown individuals are so detailed that the reader comes to care for these people as well, though most are long dead. The book contains other interesting facts, such as that 10% of individuals have mercury levels above the recommended nutritional guidelines, making them unsuitable as food for cannibals. Somehow one can draw some comfort from that statement. Yet there are some weaknesses in the book. The introductory chapter lists an extensive history of alchemists, and although this lends credibility to the author’s research, it is dry reading, and the selected elements are profiled more extensively later in the book. Not to worry, though. The reader becomes engrossed by the second chapter as it delves into details on mercury. Another concern is the limited reference list and citations, which require the reader to rely on Emsley’s knowledge and that of the individuals cited for their help in the manuscript. Pertinent citations for the facts and case studies would have enabled the reader to pursue selected areas further. For example, on what basis does he conclude that Rasputin was not killed by potassium cyanide as his stomach had insufficient acid content to convert this to hydrogen cyanide? Emsley would have no way of knowing the acid content of Rasputin’s stomach. Even with these lapses, the book is enjoyable. Included is a letter written in 1786 by Benjamin Franklin stating that the dangers of lead have been known for at least 60 years yet “you will observe with Concern how long a useful Truth may be known, and exist, before it is generally receiv’d and practis’d on.” All medical practitioners, scientists, and historians will find kinship with this statement. Lest we begin to feel superior to the ancient Romans, Emsley provides an extensive discussion on the harm we have done to ourselves by using lead as a gasoline additive. It is this exploration of each element’s use throughout history and the case studies that provide such interesting context in the book. This book is highly entertaining, inspiring one to seek out other books by Emsley and wonder how he would view new cases. There is a recent report of a man who was given elemental mercury by his mother-in-law and suffered from nausea, lethargy, and tremor until resolution of these symptoms following cessation of this consumption (1). Although elemental mercury generally isn’t absorbed by the gut and the author of the case study does not offer any dark motive, one cannot help but wonder what Emsley would make of the case of a flight engineer from Singapore and his mother-in-law’s ministrations. Yoong, J.K. 2006. Images in clinical medicine. Heavy-metal meals of mercury. N. Engl. J. Med. 354:e3.